Name, date and place of birth not yet verified. 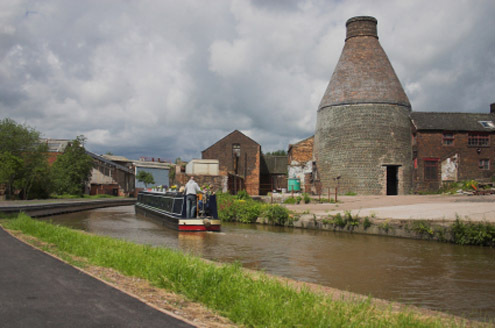 Stoke-on-Trent, Staffordshire, centre of The Potteries, famous for its bottle kilns. A man, who gave his name as William Heath, was enlisted in the U.S. Army at Cincinnati, Ohio, on 9 October 1875 by Lt. Patrick Cusack. * He stated that he was 27 years of age, born in the county of Staffordshire, England, and was described as having blue eyes, brown hair, a dark complexion, 5′ 7 1/4″ tall, previously employed as a coachman. It follows that until the true identity of this soldier can be verified beyond any reasonable doubt his name, age and place of birth must remain uncertain. Company L, together with Company E, left Fort Totten on 10 April 1876 and arrived at Fort Abraham Lincoln seven days later “to join in an Expedition against hostile Sioux – in obedience to S.O. #27 pay IV Headqtrs Dept. of Dakota.” On 5 May, together with the Regimental Commander [Custer], the Field Staff, the Band, and six other companies, Company L left Fort Lincoln and joined the remainder of the regiment in camp two miles south of the post. William Heath was killed with Custer’s column at the Battle of Little Big Horn on 25 June 1876: most likely with his company on Calhoun Hill, though as Frederic Wagner says (Participants, p. 48) the possibility exists he was one of those killed during the panic through the Keogh sector. 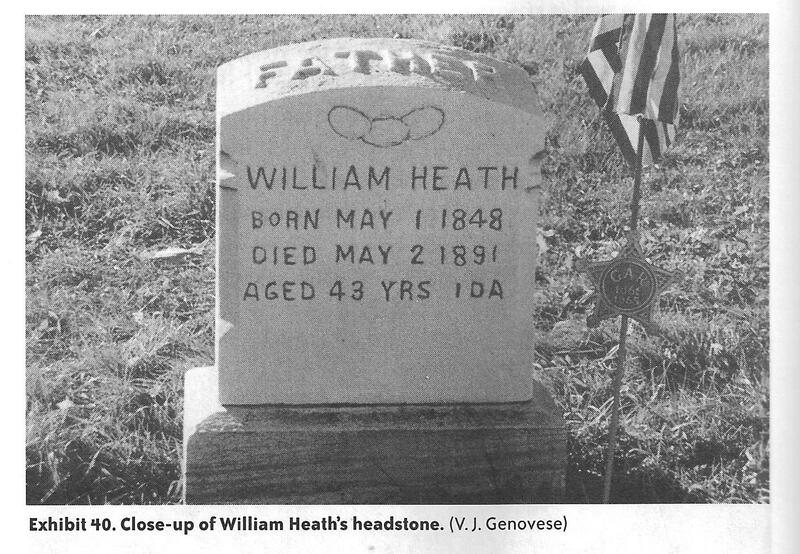 He is listed as W. H. HEATH on the battle monument, which was erected in 1881. I have found no explanation for the addition of the second initial ‘H’ that first appeared in the list of those killed in regimental return for June 1876. Final Statement of William H. Heath (Farrier) [Captain Michael Sheridan’s Company] signed by 1st Lieut. W. S. Edgerly, Commanding Company, at Fort Abraham Lincoln on 31 January 1877. The above statement does not take into account basic pay due for the period May 1 to June 25, 1876. Or, did he survive Custer's Last Stand? The sailing ship 'Shenandoah' left Liverpool on Monday, 27 May 1850 bound for Philadelphia, Pennsylvania (Lloyd's List, 28 May 1850). Among those on board were Ann (Bagnall) Heath, 27; sons, Arthur, 5, and William 3; and Sarah Heath, 8 (presumably a close relative) - all from Staffordshire. The 'Shenandoah' arrived in Philadelphia 61 days later on 27 July. Extract from the ship's manifest. An exchange of correspondence in 2005, via a third party, with a direct descendant of the William Heath who died in Tamaqua, Schuylkill, County, Pennsylvania, the subject of Vincent J. Genovese’s Billy Heath: The Man Who Survived Custer’s Last Stand, revealed that at least some members of the family disassociate themselves from the Genovese account, much of which they claim is pure conjecture. In over 200 pages and ever-present claims that he had proved his case I did not find a single shred of evidence that positively connected the cavalryman with the coal miner. Apparently no one in the Heath family ever referred to him as “Billy” and his being found by a member of a wagon train is just one of several figments of Genovese’s vivid imagination. In their version of the story William Heath was nursed back to health by a family of homesteaders and his army rifle remains a prized possession. I use the word ‘version’ advisedly because, while not questioning their undoubted sincerity, my correspondent was unable, or at least unwilling, to produce any hard evidence to substantiate that their ancestor ever served in the United States Army, let alone being a member of one of Custer’s ill-fated five companies at the Battle of Little Big Horn. However this in itself doesn’t automatically rule him out as being a survivor of ‘Custer’s Last Stand,’ but, alas, at best it brands him as a deserter, guilty of the theft of army property (i.e. a rifle and a belt), who added absolutely nothing to our knowledge of that decisive phase of the battle. It is my considered opinion that Billy Heath, the coal miner, never served in the U.S. Army, let alone the 7th Cavalry! For what it’s worth I submit he was a man who needed an alibi to account for his dereliction of duty as a policeman at the local coal mine and, ‘while on the run’, maybe his path did cross with a genuine army deserter from whom he purchased a rifle and a belt after discovering that a ‘William Heath’ was among those killed at LBH. 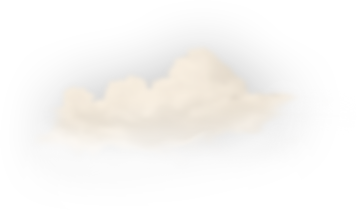 He took this unique opportunity to cover his tracks by using these items to support the apocryphal survivor story that he only ever told to his immediate family. It is the same ‘fairy tale’ which his descendants aggressively continue to defend is true. Note: According to the descendants of the Tamaqua William Heath, he was son of Samuel Heath and Ann Bagnall, born on 2 May 1846 in Fenton, one of the six towns that constitute the city of Stoke-on-Trent. Arnold Bennett, author of the classic novel, Anna of the Five Towns (1902), decided that “Five Towns” was more euphonious than “Six Towns,” so he omitted Fenton (sometimes referred to as “the forgotten town”). 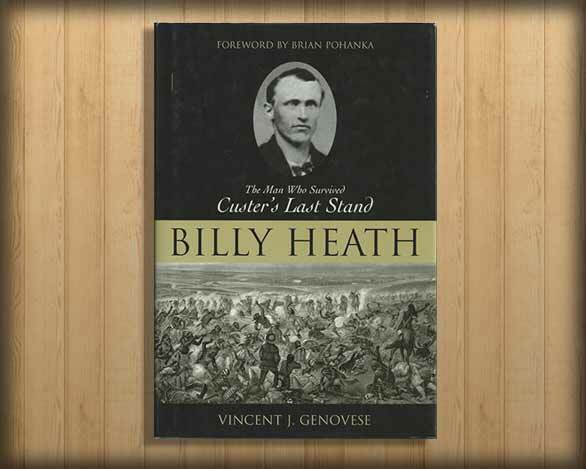 Billy Heath: The Man Who Survived Custer's Last Stand, by Vincent J. Genovese, p. 212. Prometheus Books, Amherst, New York. 2003. The inscription carved on Heath’s headstone in the Odd Fellows Cemetery, Tamaqua, shows 1 May 1848 as his date of birth, while the age given in the ship’s manifest above suggests he was born in 1847 – it’s all very confusing.